Celebrating the life of Kenneth Gordon Jamerson, Jr.
Obituary for Kenneth Gordon Jamerson, Jr.
Mr. Kenneth Gordon Jamerson, Jr., 44, of Fayetteville died Saturday at Cape Fear Valley Medical Center. He was born in Germany on October 5, 1974 to the late Kenneth and Barbara Jamerson. He was preceded in death by his daughter, Ashley Jamerson. 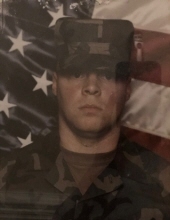 Kenneth served in the U.S. Army for fourteen years and served in Iraq Freedom. He was a member of Harnett Co. DAV Chapter 74 and the Wounded Warriors. A memorial service will be held Friday at 10 a.m. at Sandhills State Veterans Cemetery by Father Kelly. He is survived by his wife, Maria M. Jamerson, two sons, Joseph K. Jamerson and Matthew J. Jamerson both of the home, four step sons, Anthony Villena, Roniel Villena, Vicente Villena all of Fayetteville, Rufino villena of N.Y., a step daughter, Angela Villena Harvey of KY, three sisters, Kendra Thesis of West Virginia, Nancy Jamerson and Mary Jamerson both of Maryland. To send flowers or a remembrance gift to the family of Kenneth Gordon Jamerson, Jr., please visit our Tribute Store. "Email Address" would like to share the life celebration of Kenneth Gordon Jamerson, Jr.. Click on the "link" to go to share a favorite memory or leave a condolence message for the family.